Certain EQ competencies are declining more rapidly, including the ability to navigate emotions (which creates emotional balance), engage intrinsic motivation (which is internal drive), and increase empathy (which facilitates connection with others). These declines could lead people to be more reactive/volatile, passive, and isolated — which would have profound effects on personnel, customers, and even the market as a whole. On the good news side, consequential thinking is increasing, a skill used to pause and consider your choices before acting. Particularly in light of the declines, this increase suggests people will be more evaluative or cautious — which could lead to a very positive shift toward a more careful way of interacting. We can leverage these growing strengths by focusing on building resilience, taking the time to carefully consider our next moves, and to invest in organizational, product, and service design to optimize our success. The report reveals telling details about the EQ competencies that distinguish employees, managers, and senior executives, providing powerful guidance for developing leaders and career advancement strategies. It also ranks EQ by business sector, so you can see at a glance how your industry compares. Perhaps it will be no surprise that of the sectors analyzed, “IT/Telecom” has the lowest overall EQ — which presents tremendous challenges in a rapidly changing, growing sector where collaboration is increasingly important. The highest-scoring sector may be a surprise! 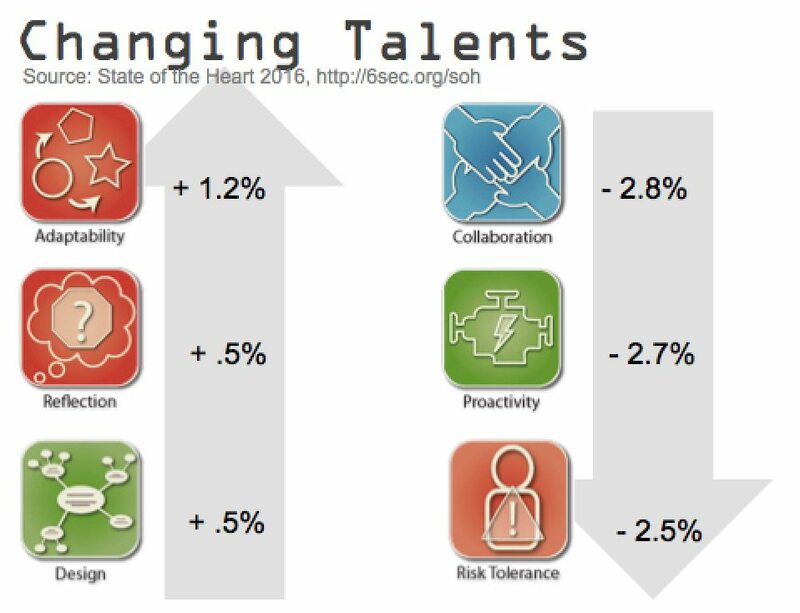 Finally, the State of the Heart 2016 report pinpoints the highest Brain Talents for top performers in each of 8 business sectors. Top performers in various sectors possess a unique mix of capabilities; armed with this information, businesses can target their hiring, selection, and evaluation systems. The State of the Heart is an ongoing project of Six Seconds, the first and largest global nonprofit organization dedicated to researching and supporting the development of emotional intelligence. The data is primarily from working adults from 126 countries, using a randomized sampling methodology to create a balanced, substantive research sample as a basis for global comparisons. Mining insights from research like this, Six Seconds offers powerful models, methods, and assessment tools that support organizations to be more effective in the people-side of performance. Learning and development professionals use these solution to measure and enhance leader performance, team and organizational climate, strengthen selection and professional development initiatives. A growing body of research shows a powerful business case for making emotional intelligence part of the organizational culture. To find out more about Six Seconds’ tools for business, including how to become certified in our assessments, or to connect with a Preferred Partner or Certified Assessor in your region, contact us. 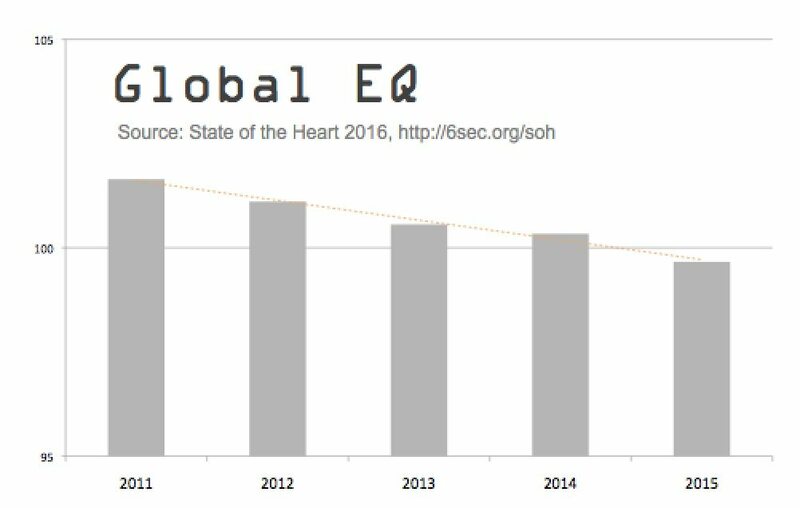 The full State of the Heart 2016 report with the latest data on emotional intelligence is available for free download.